Stillwater City Hall is located at 216 North Fourth Street, Stillwater MN 55082; phone: 651-430-8800. Photo: William Sauntry House, ca. 1902, 626 North 4th Street and 625 North 5th Street, Stillwater, MN. Listed on the National Register of Historic Places in 1982. Photographed by User:McGhiever (own work), 2013, [cc-by-3.0 (creativecommons.org/licenses/by/3.0)], via Wikimedia Commons, accessed October, 2013. Stillwater's character is defined by natural features, the St. Croix River, the river valley bluffs, historic structures and the rolling hills and lakes. The historic section of the city lies in and around a "bowl" defined by the St. Croix river bluffs on the south, west and north and the river and Wisconsin bluffs to the east. The downtown commercial historic district is made up of brick structures which were generally constructed during the height of the lumbering period dates (1860-1910). The core of these structures are on Main Street, a two-lane roadway. The perimeter of the central district is marked by contrasts. To the south are the steep chalk cliffs of the river bluffs and a natural vegetative buffer along the river. The north is a diverse area centered around the historic Staples Mill, a new brick office building and a manufacturing building. A reproduction of an old railroad depot and the remains of the old territorial prison define the northern edge of downtown Stillwater. Bordering the downtown on the east, is the St. Croix River, a National Wild and Scenic River. Lowell Park provides a buffer and transition between the downtown commercial area and the river. To the west of the Central Business District is a bluffline. The church steeples, historic courthouse and Victorian homes set against blufflines gives Stillwater its enclosed, unique New England character. Stillwater neighborhoods are each defined by their borders as well as their architectural uniqueness and historical values. As Stillwater expanded out from the core, lumber barons built their great mansions overlooking the river. 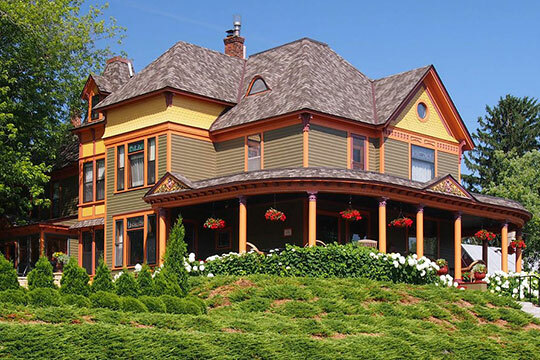 The homes were constructed in the Victorian style typical of the period. The north and south hills are defined as areas where the wealthy resided. As Stillwater developed during the lumber boom, land for new housing became scarce, especially housing for the working class. Some large parcels were subdivided into small lots and small vernacular houses built. This contrast in housing styles, sizes and periods of construction create diverse, interesting neighborhoods. The existing ravines and bluff areas define residential areas. Many ravines were either filled to build roads or used as dumping grounds. Today the remaining ravines offer open space and natural and wildlife areas. With the demise of the lumber industry after the turn of the century, the city boundaries did not expand. All new residential development was concentrated within the city. The houses of the time consisted of Craftsmen style and bungalow styles. Within the residential areas, corner stores were established to service the neighborhoods. It was not until the 50's that the city began to physically expand again. The Forest Hills and Fairmeadows area were developed. These residential areas consist of ranch-style homes on large lots with mature trees and well landscaped yards. In the 70's, the Highway 36 commercial corridor began to develop. Commercial and industrial development occurred along the corridor, characteristic of other suburban areas. The 70's saw the Croixwood Development (Orrin Thompson). These homes were developed for young families. Today Croixwood still lures young families and has become a neighborhood with a strong sense of residential community. The houses in this neighborhood generally consisted of two-story, split level and ranch style homes. The 80's saw the development of Oak Glen. Home sites on its executive and championship golf course makes it quite appealing. In the 1990's, the city has experienced the development of the 200-lot Highlands neighborhood. The Highlands of Stillwater was targeted for young families. The homes are typically split-level and tri-level residences. The neighborhood is adjacent to Lily Lake Elementary School and includes a five acre neighborhood park. The area is close to shopping and jobs in the West Stillwater Business Park. Stillwater is blessed with a variety of open space resources that make the area distinct and interesting. A dominant natural feature is the St. Croix River the eastern border to Stillwater and the downtown. Stillwater's history began on the St. Croix and the river continues to be an important natural element to the City of Stillwater and downtown open space system. The ravines leading to and blufflands overlooking the river contribute to the open space system particularly for the older developed part of the city. Over time, many of the ravines have been filled in to make room for roads and building sites, but recently the community has developed an awareness and sensitivity to the preservation of ravines as a natural resource, open space separator and possible trail location. Stillwater has an older housing stock. The median age of Stillwater housing is 1950 with only 12 percent of the housing units built since 1980. Fully 40 percent of the Stillwater housing stock was built before 1940 with 70 percent of the North Hill, South Hill, West Hill and Downtown area constructed before 1940. The census figures show Oak Glen as the newest construction area for the 1980's, Croixwood for the 1970's and Sunnyslope and Forest Hills in the 1960's. Stillwater is typical of Washington County and the state with just over 50 percent of the population living in the same household in 1985 as 1990. Of those who moved into Stillwater from 1985 to 1990, 22 percent moved to Stillwater from other parts of Washington County, 12 percent moved in from other parts of Minnesota and 12 percent from another state.